Photograph of a woman identified as Lily Hanscom, taken by the Roberts Studio of Portland, Maine. Researching online, I found a Lillian Hansom who might fit the bill, but I'd appreciate hearing from readers who recognize her from family albums. There was a Lillian K. Hunnewell who married Herbert H. Hanscom at Lewiston, Maine, on 23 March 1901 at Lewiston, Maine. They later moved to Portland, Maine. 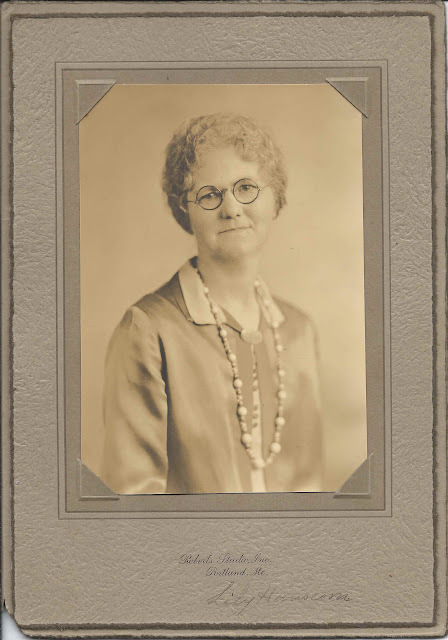 Lily Kennedy (Durrell) Hunnewell was born about 1880 at Lewiston, Maine, according to her marriage record, or Nobleboro, Maine, according to Outline sketch of the descendants of Nathaniel Durrell, of Kingfield, Maine, written by Harold Clarke Durrell in 1910. Her parents were Abram Granville Durrell and Eudora (Merrill) Durrell, born at New York, New York, and Nobleboro, Maine, respectively. Lily's mother had died by the time of Lily's marriage. Abram's second wife was Mary Patten Libby. I was thrown off by the 1900 Census of Lewiston where Lily is noted as a stepdaughter, which I thought might clear up the Durrell/Hunnewell confusion, but I think that stepdaughter relationship referred to Abram Granville's wife, not himself. Herbert H. Hanscom was born 21 June 1878 at Lewiston, Maine, son of Sullivan K. Hanson and Emma Pullen, born at Mechanic Falls, Maine or Minot, Maine, and Freeman, Maine, respectively. Herbert and Lily raised a family of, perhaps, five children. If you have corrections/and or additions to the information above, or if you know that the woman in the photograph is a different Lily Hanscom, please leave a comment or contact me directly.